The Scriptures include many types, or figures, which help illustrate important foundational truths. 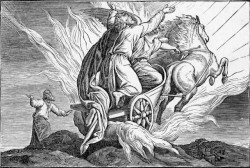 In this look at the ministries of Elijah and Elisha, we see Elijah as a type of Old Covenant prophet, while Elisha is a type of the New Covenant prophet. Similarly, John the Baptist is the last of the Old Covenant prophets, ministering in the spirit of Elijah with repentance, while Jesus is the greatest Prophet under the New Covenant. All who are baptized in the Holy Spirit are meant to carry on this New Covenant prophetic ministry. Just as Elisha's ministry brought the removal of a curse, Jesus ministers in the Spirit of His Father, removing the curse of sin and bringing life. In 2 Kings 2, after Elijah was taken up, Elisha healed the waters at Jericho that had been cursed by Joshua. Jesus is the healing water for us now in the New Covenant. Percy Gutteridge explains clearly the scripture “For I say unto you, Among those that are born of women there is not a greater prophet than John the Baptist: but he that is least in the kingdom of God is greater than he” (Luke 7:28). This message seems to have been delivered at the first Vineyard Church, pastored by Ken Gulliksen. Ken and Pastor Gutteridge were fast friends.